Chair straps secure the booster seat in place. 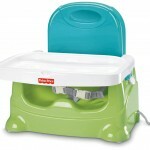 The Fisher Price Healthy Care Booster Seat is one of the top rated boosters on the market. It has a three-point harness, and three height positions which allow it to fit at almost any table. There are three positions for the tray. The tray is removable and fits easily in the dishwasher. The booster has two adjustable straps that secure it firmly to a chair. The seat back can also be removed for the comfort of an older child. Like a highchair, you can use a booster without a tray, and push it right up to the table. To make your life easier, the Healthy Care seat is free of crevices, so it won’t trap crumbs, and is a snap to clean. 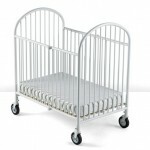 You can use this booster from the time your child can sit unattended, until a weight of 50 pounds. If you have never used a booster seat for your child, now’s the time to give one a try. You’ll love the convenience and ease of use. Best of all, cleaning is a breeze. You don’t have to worry about cleaning crumbs out of all those nooks and crannies. And if you have a major mess on your hands, you can dump the whole thing into the sink (or bathtub). You can’t do that with a highchair! Plus, this booster is easy to transport. So if you are planning to visit friends or relatives, or even eat in a restaurant, you can just pack it up and take it along. You can’t do that with a highchair!